Description A bright and happy golfer, Sonny is very talented and sticks to a traditional play style. 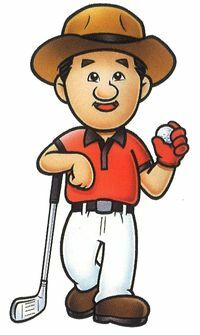 Sonny is a peppy human male golfer in the Mario Golf series. His only appearance being in Mario Golf for the Nintendo 64, he is the third character unlocked in the Get Character mode. Sonny's attire consists of a red polo shirt and tan pants, as well as a brown cowboy hat. The only times he is seen without his hat is when the player scores an eagle shot or higher, after which Sonny tosses it off and exuberantly shout "Yahoo! ", or, if having scored a bogey or lower, hangs it in shame with a resenting "Oh, no!". He is voiced by David White. Sonny and Plum are the only two human golfers whose skin color can be changed from light to dark at the character select screen. ↑ Confirmation from David White via e-mail. This page was last edited on February 1, 2019, at 00:22.